Synopsis: This drill could be viewed as a team pepper type of exercise. By that I mean the aim is keeping the ball in play rather than go for the point. In doing so, it focuses on several facets of ball control. There is also an element of problem-solving and potentially a strong dose of mental toughness work mixed in. Age/Skill Level: This is a drill for intermediate to advanced players. Requirements: 8 players, full court. Execution: Put one player each in positions 4, 5, and 6 with a setter at the net on both sides. The drills runs similarly to the Hard Drill in that the players have to keep the ball in play. In this case, however, all sets go to the OH in position 4. They must attack cross-court so their teammates on the other side of the net can dig and attack back. 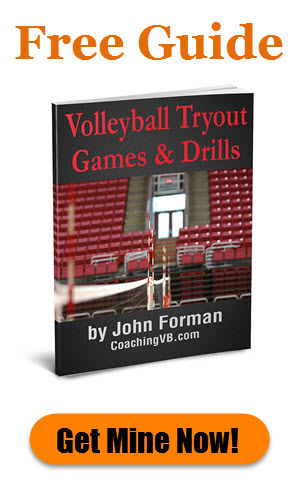 The objective is to get 10 good dig-set-hit sequences without the ball hitting the floor. If it does, the counter resets to 0. 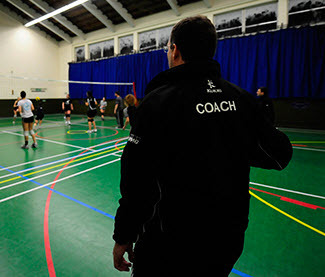 Players can be required to rotate positions each time they send the ball across the net. 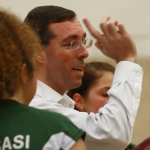 You could leave a setter and/or libero in place and have everyone else rotate around them. You can vary the number of successful reps required based on the level of the skill of your team. With advanced teams you can require they complete the 10 reps consecutively. By that I mean the ball only crosses the net 10 times. 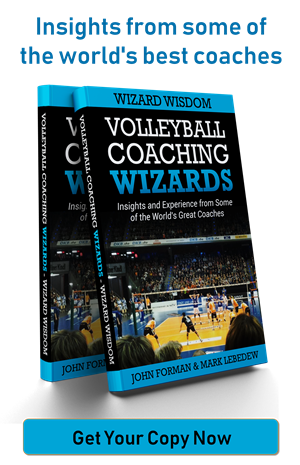 With less advanced teams you can allow for faulty sequences where a team cannot execute a proper dig-set-hit, but keeps the rally going. In that case, you count the good sequences and don’t go back to zero unless the ball hits the floor. Your could require setters to penetrate from back row if you use just your actual setter(s). 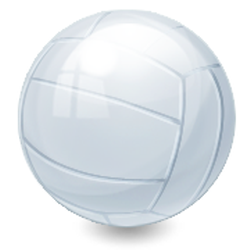 The setter can be required to block (if not penetrating as above). Make sure to enforce that successful reps only count if there’s a dig, a clean set with hands, and a legitimately attacked ball (no soft swings). Allowing a team to not have to get all 10 reps in a row will result in faster completion of the drill if time is a concern. It will also let you get the players to focus on keeping the ball in play when they are in scramble mode. Because there can be considerable frustration with having to restart on errors (or discontinuities), mental toughness is often a developmental aspect to this drill. You may have to put a time limit on the drill to keep to your practice plan. There is a problem solving element to this drill in that it behooves the players to make sure the best defenders receive most of the hits to keep the play going. This thinking is something you may have to hint at if they aren’t getting it.